This beautifully decorated beach retreat offers excellent views of the sparkling blue Atlantic Ocean and the cheery decor will certainly put you in that tropical mood. Enjoy the Ocean Drive Difference by starting your vacation immediately upon arrival, as this property comes with fresh bed linens/bath towels, the beds are already made up for you, and the departure maid service are all included in your price. Four bedrooms and three full baths make this the perfect vacation destination for larger families or couples traveling together. Vernadas 901 has televisions in all bedrooms and the living room has a television with DVD player and VCR, a fully equipped kitchen complete with dishwasher, microwave and as an added convenience, there is a washer and dryer to help make keeping up with the laundry easy and stress free. Sit out on the oceanfront balcony and relax with a cup of coffee as you start another great vacation day. Or maybe you'd like to lounge by the pool or the lazy river, read a book and work on your tan. 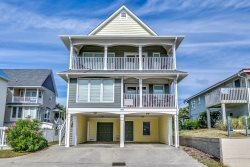 The Verandas is located in the Ocean Drive Section of North Myrtle Beach and is literally steps away from Main Street, where you will find shopping, dining, dancing and the newly reopened Ocean Drive Pavilion & Amusement Park.